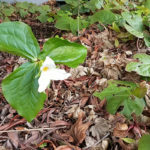 Right now the non-native cherry trees, forsythia, and daffodils are dazzling us with their showy displays, but many other native species are blooming as well, such as kinnickinnick, trilliums, and bleeding heart. Kinnickinnick is an evergreen, drought-tolerant, low-growing native shrub that is an excellent groundcover for tough spots such as parking strips. 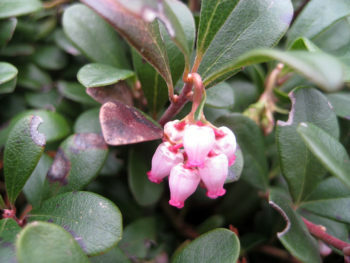 Its small pink flowers are not showy, but are important sources of food in early spring for pollinators like bumblebees, syrphid flies, and mason bees. White trilliums are long-lived herbaceous perennials of the forest floor; many do not bloom until they are seven years old! They are mostly pollinated by moths, beetles, and bumblebees. 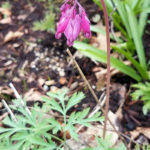 Dicentra, or bleeding-heart, is another long-lived understory perennial. 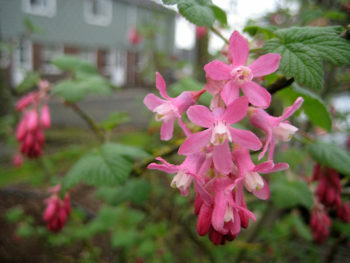 Its delicate pink flower is an important spring necter source for hummingbirds. Flowers that bloom early in the spring and late in the fall are very important to wildlife, so the longer you have flowers blooming, the prettier your yard will be for wildlife as well as for humans! Welcome to EMSWCD’s Nature Notes series! When EMSWCD purchased this property for our office, the yard consisted of a weed-filled lawn with a few trees. Our staff kept the trees, removed all the grass, and began landscaping and installing hundreds of native plants. Every year since then we’ve continued to add plants and make adjustments as needed, and the landscape is now totally transformed!